Let me have you pause for a minute there and ask a few questions. 1. Have you worked with CE before? 3. Are you trying to do akin to a Total-Conversion mod, or just a series of maps? Answer those to start, if you would. 3. Somewhat, yes. I aim to create full custom maps, tags, HUD, characters etc. I won't be trying to change the actual Halo programming so it will play essentially like halo, but in the Silent Hill universe. Straight to the point without filler, excellent! Would you perhaps be willing to share some examples of your previous work? I am moderately interested in seeing what you have to offer. Sadly due to a computer crash (the reason I previously left the more complex maps unfinished) I don't have any of my prior work. Probably the best I can give in it's place is the model I built in Sketchup for my architecture studio assignment. It's about the only significant example of my modelling work I available. That may suffice so long as it shows your skill adequately. For future reference, try avoiding FB as an image host. Use something like imgur. Yup. That being said, the laptop I was using should have died months earlier. It had no battery, it's monitor keyboard and trackpad were all broken, so it was perpetually plugged into power, an external monitor, mouse and keyboard. It also used to get hot enough to burn my hands. To be totally honest that kind of geometry would work pretty well in CE, and it doesn't look terrible either. If you did the environments, it wouldn't be too hard to get the rest of the project set up so long as you have a team who is good at scripting and animating. You better have this as an ending, just saying. Hmhmhm, that'll be the finishing touch for sure. I can tell you for a fact that this model isn't sealed properly, but that is because for it's purpose, it didn't need to be. Given a few hours I could make it a usable model. Not that I plan to. My friend Linden called his brother and said "Jonno, I need you to go have a look at the mirror in the bathroom. Jonno: "I'm looking at it"
Are u making the whole silent hill 1?? I am so excited about dis!111!!! Is it first person view in game? It's not Silent Hill 1 - it's a spin-off/ reboot type thing that draws elements from all the games and the movies. Yes, it'll be in first person. You're a big fan of Silent Hill I take it? AND HIS NAME IS JHO....PYRAMID HEAD!!!!! What is Silent Hill? Is it similar to Halo at all? 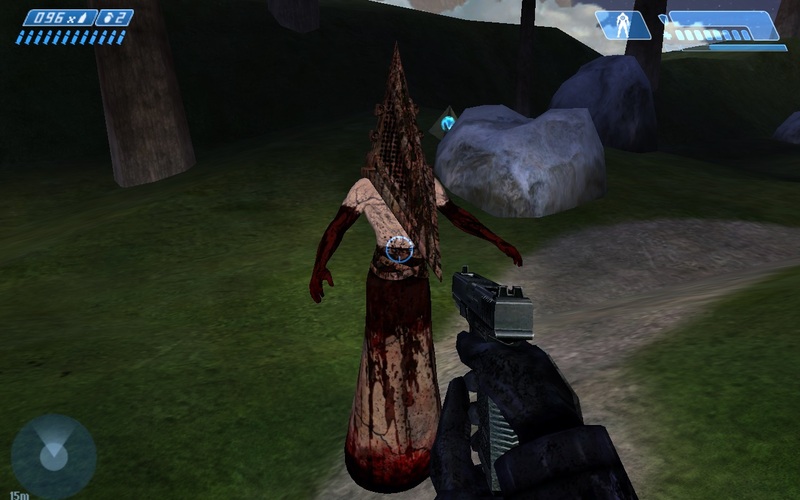 Is it Silent Hill-Themed Halo map? Or is it a Silent Hill map in Halo? Good luck rigging that skirt. Silent Hill's a horror game that's been around for a long time. Like, it goes waay back. I haven't played enough of the games to know, but no it's not really similar to Halo. And I think it's a Silent Hill-Themed Halo map they're going for? The plan is to create a full campaign story experience, with all original/taken-from-silent-hill models, custom hud, additional components (such as maps). Traditionally Silent Hill is played in 3rd person, however I wanted to do it in first person. can you show renders or images of the ripped models? That being said, we've only just started this week. Silent hill movie is known to be a terrible adaptation of the game. To be totally real though, just grab a PS2 emulator and the silent hill games, run like that. I personally thought the first film was great - yes it differed from the game, but that's why it's called a film adaption. Truth be told it did an exceptional job of recreating the mood of the games. The second movie was definitely not a great film. Though, the casting for Heather was brilliant. Still even with it's flaws, it entertained me, and that is one of the two things I want from films. I just loved the cleavages the weird nurse monsters sported. Though I would probably need a brown paper bag if I really wanted to commit to a serious relationship. Hey remember when PT (Silent Hills) was a thing? Oh that's right, Konami killed it for pachinko machines. I don't think it is within Konami's mandate to do anything but utterly screw up, scandalise and piss people off. Live long Hideo Kojima, live long you awesome Asian. Time: Wed April 24, 2019 1:08 AM 359 ms.